The snow was plentiful in January and I took full advantage with ski trips to the Rocky Mountain Front, Rogers Pass area and the Little Belt Mountains. Of note was the a Jan. 20 trip to Cadotte Creek area just west of Rogers Pass. 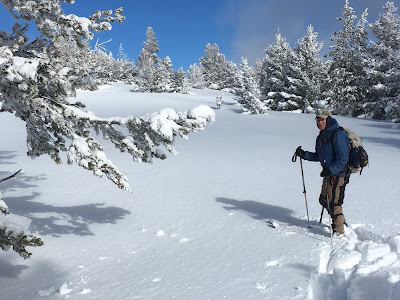 We hit it on a glorious, sunny, but chill winter day, skiing a ridge above the creek's eastern-most tributary, Swamp Creek, and making a loop out of it by coming down the opposite ridge line. What made this so special were the open, gentle ridgelines and fabulous views into the Continental Divide country near Rogers Pass. We have skied many of the Cadotte area roads, but so many of them have been logged and aren't as aesthetically pleasing as this one. The snow was a bit on the soft side, but we managed some long turns. We'll be back to connect this ridge to others in the area. 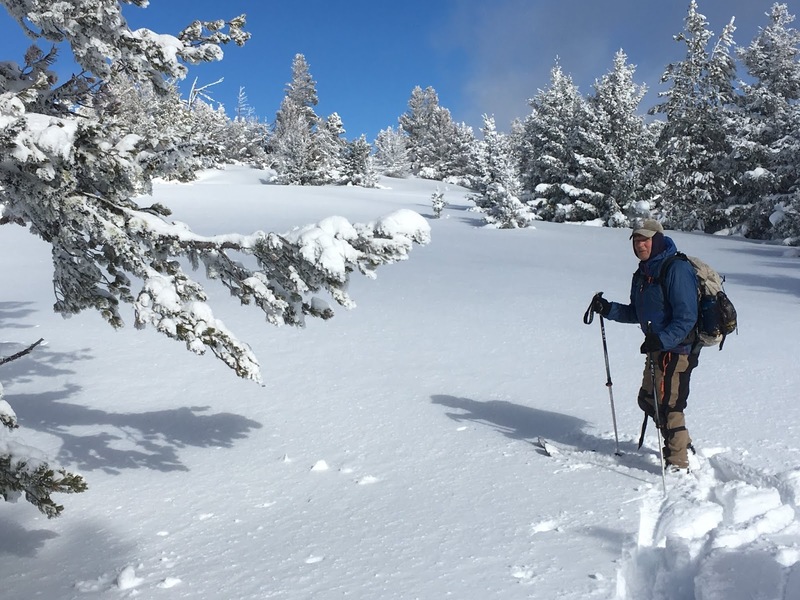 Katie and I did a Montana Wilderness Association snowshoe hike up the Middle Fork of the Teton up the Teton Canyon on Jan. 23 and found pretty fair and skiable snow up that drainage. We had high winds and lots of clouds. We did another MWA snowshoe hike on Jan. 27 up McKee Coulee in the Little Belts just east of Monarch. This is an area just off the Dry Fork Road marked by tall limestone spires. After a couple of miles we ditched the hike and turned around as a snowstorm hit the area. 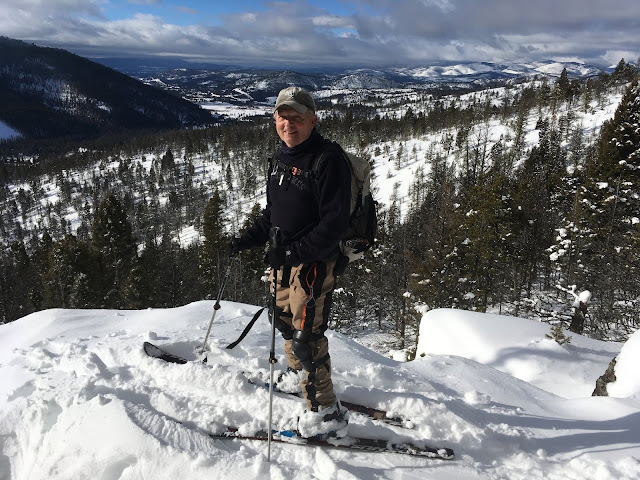 Then, on Jan. 30, Wayne's Wild Walks minus Wayne, skied to the Mizpah Bowls out and back and threw in a side trip of the Trail 747 loop around the back side of Porphyry Peak for a 10 miles outing that gained and lost more than 2,000 feet. The snow was exceptionally consistent and good and deep where it hadn't been tracked. Breaking trail was a vigorous activity. We planned to do it the 747 part again on Friday, Feb. 1. After lunch, the skies cleared, and the sun came out. We did see a large avalanche slide on Mizpah's southern-most slope. With all the snow the slopes are really dangerous.